In the competitive class of compact cars, the 2018 Mazda3 stands out for its good value and upscale touches. It was named the Best Small Car in Canada for 2018 by AJAC, and for good reason. It’s well-designed and approaches luxury standards, both inside and out. At the low entry price point of $15,900 (MSRP), sophistication has never been more affordable. You’ll buy the 2018 Mazda3 for its excellent fuel economy and affordable pricing, but you’ll come to love its ride comfort, maneuverability, and premium interior. All trims are now equipped with automated emergency braking. As well, the top trim’s Premium Equipment package now has Mazda’s i-Activsense active safety technologies. Those consist of automatic high-beam headlamps, lane-departure warning with lane-keeping assist, adaptive cruise control, and traffic sign recognition. Standard and available features available to all trims now include forward collision warning and automatic emergency braking systems, as well as a rearview camera. Simply put, the 2018 Mazda3 is a fun car to drive. Its handling is sharp and responsive, and will you have zipping down winding roads with a smile on your face. That’s in part due to Mazda’s G-Vectoring Control (GVC) system that improves stability, increases traction, and reduces driver workload. Your passengers will be thankful for a less nauseous ride, but you’ll be having too much fun driving to notice. For its smooth drive, we can thank the SKYACTIV technology that’s engineered into every part of the Mazda3. This innovative tech improves fuel economy, strengthens the chassis, and makes for a safer drive. The base engine is a 2.0-litre 4-cylinder engine that produces 155 horsepower and 150 lb-ft of torque. The top engine is a 2.5-litre 4-cylinder that generates an impressive 184 horsepower and 185 lb-ft of torque. A 6-speed manual transmission is standard on all models, with a smooth-shifting 6-speed automatic made optional. In terms of fuel economy, the 2018 Mazda3 manages 8.5 L/100km in the city, and 6.2 L/100km* on the highway. That’s at its best, with the base engine paired to a manual transmission system. Alternatively, with the top engine and automatic transmission, it gets 8.8 L/100km in the city, and 6.6 L/100km on the highway. Its fuel economy ratings give it a competitive edge over most of its competitors. 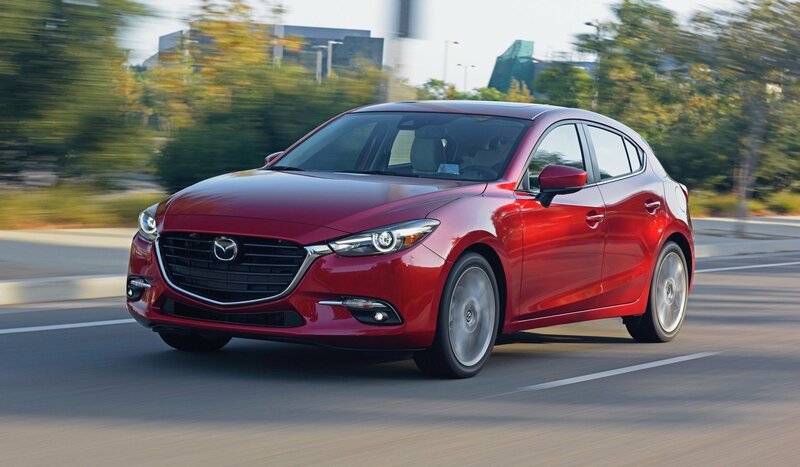 In sum, the 2018 Mazda3 is a top contender in its class in terms of performance and fuel economy. It even gives the highly-acclaimed 2018 Honda Civic a run for its money. *Editor’s Note: I drive a 2018 Mazda3, and I have personally seen it hit 5.6 L/100 km. The numbers above are what’s listed by the manufacturer. The 2018 Mazda3 was a big hit with safety agencies. Both the sedan and the hatchback models were named a Top Safety Pick+ by the IIHS in 2018. On top of that, the NHTSA gave it a five-star overall safety rating (the highest possible rating). Of course, there are more standard and available safety features offered to the top two trims. But the excellent safety ratings and smattering of airbags found on the base GX trim should be more than enough to put you at ease. The 2018 Mazda3’s interior is probably its best asset. It’s surprisingly spacious, and the front seat has legroom for miles. The backseat, by comparison, is less roomy. Be sure to call shotgun to avoid being the fifth passenger delegated to the middle rear seat. But seating space aside, the Mazda3 pays big dividends in trunk space. There’s enough space to squeeze in two hockey bags with some room to spare. It’s also easy to get in and out of, making it a smart choice if that’s something you struggle with. … the list goes on. You’ll also be happy to know that you don’t need to spring for the most expensive trim to have access to the best tech. Standard and available features to base trim include the bulk of what’s available to the top trim. Specifically, the most sought-after features, like the 7-inch touchscreen display and Bluetooth hands-free compatibility, are on the table. The only things you’ll be missing out on are leather trimmings and some other luxuries. To summarize, the Mazda3 provides a premium experience at a budget price. First of all, the cockpit is sound-insulated, which makes for some much-appreciated peace and quiet on long drives. In addition, there’s a Colour Active Driving Display available to the top trim. Without distracting the driver, it displays important information like the current speed limit, navigation directions, and safety alerts. It’s as advanced as any you can find in the competition and many luxury vehicles. Another thing we love about this year’s Mazda3 is its exterior design. In crafting its design, Mazda strived to give the Mazda3 a bolder, more muscular look, all while maintaining its aerodynamic proficiency. It’s safe to say that they succeeded. The front of the car is particularly eye-catching, with its distinctive grille and striking LED headlights. The 2018 Mazda3 is one of the best compact cars on the market. It’s fuel-efficient, fun to drive, and has a premium interior. What’s more, it’s a versatile, low-cost car that has the driving dynamics to satisfy your inner Ricky Bobby. Also, it’s cheap to maintain, has a long list of advanced tech and luxury features, and is one of the safest cars on the road. Altogether, the 2018 Mazda3 is everything a compact car should be. To book a test drive with the 2018 Mazda3, get in contact with Go Mazda , Edmonton’s number one Go Auto Mazda dealer. You can also visit us online by clicking here, or reach us by phone at 780-777-7777. We’re happy to help you with all your automotive inquiries!